Esther is a careworker at Siphumulile Home Based Care in South Africa“I was spending my life sewing comforters for a living to support my 3 children with my husband. I have always had a place in my heart for the children, especially those living below their means. In my community, if a hungry child came to my house, I would always feed her. God had blessed me with food every night and I was happy to share what I had with any child in need. It hurts my heart when a child tells me he’s hungry, it makes me feel like I am hungry also. So when a local clinic member told me about the group of Christian volunteers going out to care for those in need, I left my sewing behind to join them in becoming a careworker. I worked with several other women who cared about children as much as I did to fundraise so that we could feed the children of our community who needed it the most. We pooled together what we had raised and bought potatoes and machines to make chips to sell, and used the money to buy food parcels and other necessities to give to the children.” –Esther, a careworker from Siphumulilie Community Based Organisation who recently was involved in the Careworker training, Walking with Wounded Children. Nigeria is Africa’s most populous nation. Its 150+ million people makes up almost a fifth of the continent. Though it is one of the world’s top oil producing countries, over 90 million Nigerians live in extreme poverty. Institutions at every level of the country are renowned for corruption, rendering the benefit of the oil wealth nearly nil for the country’s most vulnerable people. 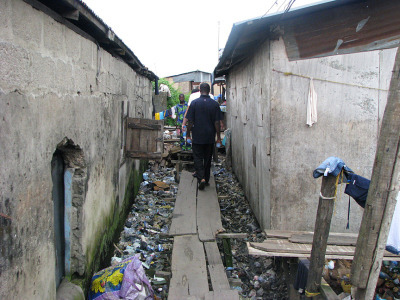 The poverty of slums within Lagos, the country’s largest city, is beyond comprehension: hundreds of thousands of the city’s poorest people are jammed into tiny rooms without water or sewage systems. 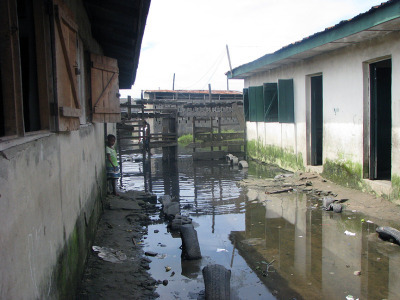 Water from intense seasonal rains and the tides of the nearby ocean bay flood the slums leaving dirty water filled with sewage and rubbish to surround even homes and schools, exposing children to bacterial disease and malaria. At 3.6%, the adult HIV-prevalence rate is low compared to countries in southern Africa. But due to Nigeria’s large population, it ranks as the country with the third largest number of people living with HIV in the world. Hands at Work began operating in Nigeria in 2006 and works in 5 communities in the country’s south, including the hyper-urban slums of Lagos and the rural villages outside the city of Ibadan. "This is the pond where three orphaned siblings, Mary, Celina and Abigail from Elekuru, have to get their drinking water. It doesn't really look clean, but it's all they have--they live in such a rural community." "Here Mary, Celina and Abigail are pictured with Hands at Work field coordinator, Bayo, outside their home. Mary's arm was badly burnt by the people she was staying with before." "This is a shot of Badia. It shows the level of rubbish and poverty the community's people have to live in. We had to walk on the planks of wood because the rubbish was filled with water and so many diseases. We were constantly walking past brothels, shops and also children with no clothes on because they simply cannot afford any." "This is a school in Badia. We [Hands at Work] have enrolled 50 vulnerable children at the school, mixed in with the government school kids. Here we are meeting some of the volunteer teachers who are with the community-based organisation (CBO) [supported by Hands at Work]. I am greeting Matilda, a teacher." "When we visited the school, the playground had been flooded and so the kids had the option of either playing in the water or having to stay in the classroom." Earlier this year on our facebook fan page we asked you to share with us photos and reflections of your time with us in Africa. There was an outpouring of responses and here are some of them. To learn more about volunteering, click here. To read about Adam Bedford's (UK) experience of the six-week orientation programme, click here.